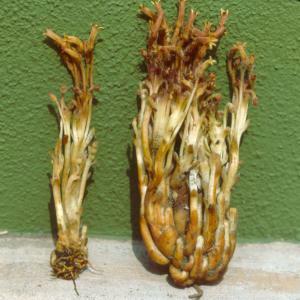 Two plants of Orobanche fasciculata that have been excavated. Notice that the lower two-thirds of the plants is white: this portion of the plants is underground, and the upper one third of the plants appears above the soil surface. The leaves of these plants are narrow and cover the stems. Some of the leaves have turned brownish. Although white when first formed, the leaves can turn brown because of injury or even natural pressure as the flowers expand and push upward through the soil surface. We value sharing, growing and learning together. In the spirit of fairness, we believe in the attribution of materials and ensuring the appropriate voices are in place when considering further use.